Pantelis Soupios obtained his B.Sc. in Geology (Aristotle University of Thessaloniki-AUTh, Greece) and his MSc (AUTh) and Ph.D. (AUTh) in Applied Geophysics. 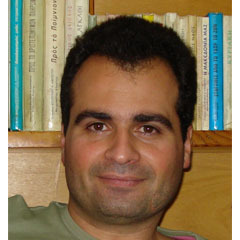 He started his carrier at the Laboratory of Geophysics and Seismology of Aristotle University of Thessaloniki in Greece. His expertise is on the application of several geophysical methods for environmental, hydrogeological, engineering applications and geohazard studies. From 2002-2018, he was a faculty member at the Department of Environmental and Natural Resources Engineering at the Technological Educational Institute of Crete, Greece. He is currently a Professor of Near Surface Geophysics at the Department of Geosciences, KFUPM, Kingdom of Saudi Arabia. Dr. P. Soupios has established a strong international research network for collaboration and has authored and co-authored numerous chapters in books, articles published in scientific journals and conference papers covering the broader area of applied geophysics. In addition, he has 6 years of industrial experience (mainly in engineering geophysics). ArchaeoGeophysics at selected Archaeological areas using various geophysical methods. Advanced geophysical/geological/geochemical methods for waste disposal sites characterization. Kleanthis Simyrdanis, Nikos Papadopoulos, Pantelis Soupios, Stella Kirkou, Panagiotis Tsourlos, 2018, Characterization and monitoring of subsurface contamination from Olive Oil Mills’ waste waters using Electrical Resistivity Tomography, Science of The Total Environment, vol. 637, pp. 991-1003. Despina Kalisperi, Maria Kouli, Filippos Vallianatos, Pantelis Soupios, Stephen Kershaw, Nikos Lydakis-Simantiris, 2018, A Transient ElectroMagnetic (TEM) Method Survey in North-Central Coast of Crete, Greece: Evidence of Seawater Intrusion, Geosciences, vol. 8(4). Victor Kavvadias, Kiriakos Elaiopoulos, Sideris Theocharopoulos and Pantelis Soupios, 2017, Fate of Potential Contaminants Due to Disposal of Olive Mill Wastewaters in Unprotected Evaporation Ponds, Bull Environ Contam Toxicol., DOI 10.1007/s00128-016-1922-4. Kourgialas, N.N.#, Dokou Z. #, Karatzas G.P., Panagopoulos G., Soupios, P., Vafidis, A., Manoutsoglou E., Schafmeister M., 2016, Saltwater intrusion in an irrigated agricultural area: combining density-dependent modeling and geophysical methods, Environmental Earth Science, 75(1), 1-13. Simyrdanis, P. Tsourlos, P. Soupios, G. Tsokas, J-H Kim, N. Papadopoulos, 2015, Surface-to-tunnel ERT Measurements, Near Surface Geophysics, vol. 13, doi: 10.3997/1873-0604.2015019. Power, C., Gerhard, J.I., Tsourlos, P., Soupios, P., Simyrdanis, K., Karaoulis, M., 2015, Improved time-lapse electrical resistivity tomography monitoring of dense non-aqueous phase liquids with surface-to-horizontal borehole arrays, Journal of Applied Geophysics, Volume 112, January 01, 2015, Pages 1-13. Soupios P. and Ntarlagiannis D., 2017, Characterization and monitoring of solid waste disposal sites using geophysical methods: current applications and novel trends, in book: Modelling Trends in Solid and Hazardous Waste Management, Edition: 2017, Chapter: 5th, Publisher: Springer, Editors: D. Sengupta, S. Agrahari DOI: 10.1007/978-981-10-2410-8_5, pages 29. Soupios P. and Kokinou E., 2016, Environmental Geophysics: techniques, advantages and limitations, (ed. Gemma Aiello – Geophysics: Principles, Applications and Emerging Technologies), Nova Publisher, USA, pp. 1-45, ISBN: 978-1-63484-831-2. The paper Georgaki et al., 2007 was in the top 10 articles published on the same topic (BioMedLib, 3 March 2011). The paper Soupios et al. 2011 was between the most downloaded articles from Journal of Applied Geophysics. The paper Savvaidis et al., 2013 received the best paper award in the First International Conference on Remote Sensing and Geoinformation of Environment, 8-10 April 2013, Paphos, Cyprus.